As operas go, Einstein on the Beach is a rich and strange one. No real characters, no plot, no narrative, no climaxes, no arias, no dialogue, no comedy, no tragedy – and yet it's an opera, or at least claims to be. The audacious confidence with which it makes this claim, in spite of all the evidence to the contrary, is a mark of John Cage's influence. Like the music-without-music of Cage's silent piece 4'33", Einstein on the Beach is an opera that's not an opera. Both these works raise questions about their form and confront their audience with issues of naming and identity. Spectators of Einstein on the Beach will generally find it either pretentious rubbish or fascinating. These questions at the core of Einstein on the Beach are reflected in the splinters of its form and its extraordinary focus on sensory information. Einstein's spectacle is ravishing. In the first scene a woman wearing a white shirt and braces strides forwards and backwards, up and down the stage; a red-shirted man in profile makes jerky movements, writing an imaginary scrawl in the air; more white-shirted figures traverse the stage in glacial slowness, following precise trajectories; a boy stood high up in the air on a crane holds a light aloft. Each new element, however slight, modifies the whole. The tableau is coherent, organised simply by the fact that it is being perceived to take place; it has no cause, and creates its own non-linear sense. Lucinda Childs's choreography is a standout quality of the show. 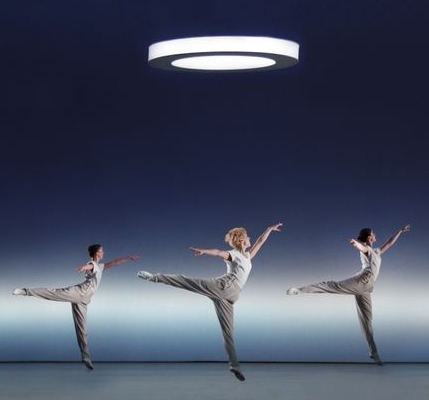 Two of the best moments in the opera are wholly given over to dance: the stage irradiating with white light, dancers spiral around in sweeping arcs, tracing a symmetrical motion. Glass's music is characteristically mixed – equal parts exciting and bland – though there is some beautiful music here, for example during the two dance scenes and the opening Train scene. As has been noted, the show feels dated, and you wonder while watching it how much of its mythos is down to its having been original at the time – a factor that has inevitably faded. But it would be premature to write it off as a period piece. 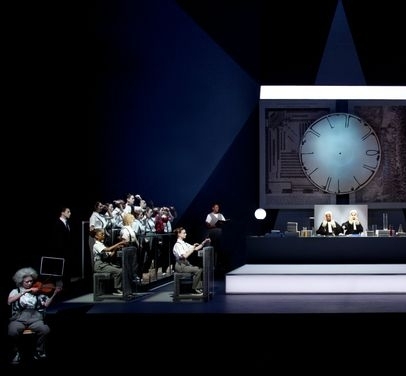 Performed in fifty years time, whether or not in Robert Wilson's original production, you can imagine Einstein having only gained in interest for its audience: it comes from a particular moment in time to which it is henceforth impossible to return. Weak aspects present themselves. At five hours in length it's an hour or two too long. Although Glass and Wilson consciously set out to write something of five hours' duration, the material doesn't support the length. This is visible in the Trial scene's reprise in variation – there's no need for it a second time, even if the scene has changed focus. The Einstein conceit is tenuous throughout. 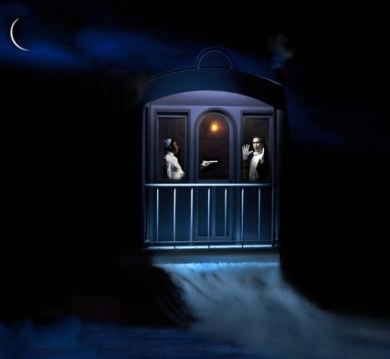 The Night Train scene is boring, seventeen minutes of two actors standing motionless onstage at the back of a railway carriage, smoke billowing down around then, miming the singing of the Philip Glass Ensemble, with a slight incident eventually occurring between them in the final three minutes. And I wasn't enamoured either of the scene comprised of a horizontal bar of white light being rotated very, very slowly until it becomes a vertical bar of white light, to the backing of some execrable music. Without an interval, you have to contend with swathes of people budging their way through the aisles throughout, going in and out of the venue, which is distracting and breaks the suspension-of-disbelief ambiance on which the show's abstraction depends. An interval would be to the work's benefit. Leaving the auditorium for a few minutes' break before returning again, I was struck by the benefit of this: when I returned the respite had made everything stand out much more vividly. Though a postmodernist label is reductive, it does point at some intriguing elements of Einstein on the Beach. The opera is a product of cybernetics and of the information age: the humans onstage are as automata, the music is the looping of bits of audio information, Christopher Knowles's text (Knowles was an autistic teenager of Wilson's acquaintance) is like the product of a basic computer programme. This is found too in the shift away from relying on narrative for formal coherence, opting instead for sympathetic resonances between structures, images and colours, which spontaneously form ties between themselves. It is in these ways that Einstein on the Beach still looks forward.